Mene exhibited the Levrier Espagnol or Spanish Greyhound in 1845 at the Salon. This sculpture is an excellent portrait of a lean racing Greyhound, it was a popular model and was edited in 3 sizes, this is the largest. It was also done with a hare in the dog's mouth. 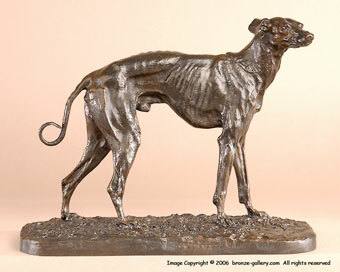 This bronze has the flat sided base used by Mene in the 1840s so it is one of the earliest casts from Mene's own foundry. 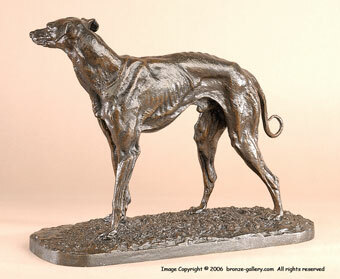 It is a sharp cast with a rich red brown patina.